I broke the rule. I rebelled and went yarn shopping. Yarn shopping before I'd knit up an entire drawer full of yarn. I'd promised myself no yarn purchases until I had an empty yarn drawer. But seriously! Who was I kidding? And actually, I've done better with the goal since I set it way back in November than anyone ever expected I would. I've had many more months without yarn hauls than with. And I only bought two skeins. I got lucky My wallet got lucky. I'd completely forgotten why I don't venture into the city more often. I hit every single stop light in the state of Virginia and even more traffic jams on the way to the yarn shop. I didn't arrive until about fifteen minutes before they closed. And before you say anything, I went in for needles. Needles that I'd called about, they said they had, but when I got there, discovered that they don't carry them after all. I was disappointed and frustrated to say the least. So you can see why I broke the No Yarn rule. I must be missing wearing my jeans because oddly, both skeins are called Denim. And even more oddly, when I insert the photos into the blog, the yarn changes color. Both skeins are much darker/grayer. They both look much more like actual well-worn, faded denim than they do in these pictures. 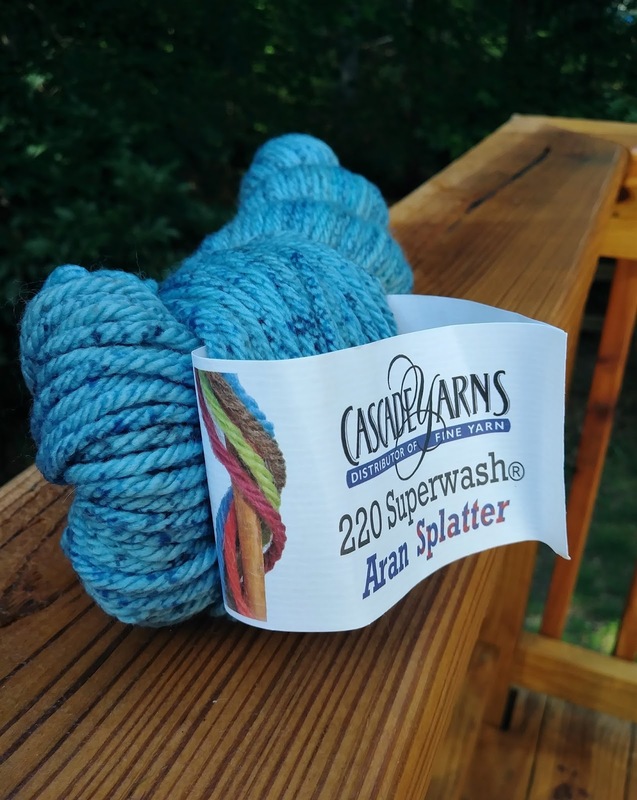 This Cascade 220 Superwash will most likely become a pair of fingerless mitts, or maybe a hat. Probably mitts. And this Blue Heron Metallic will be a cowl or scarf. 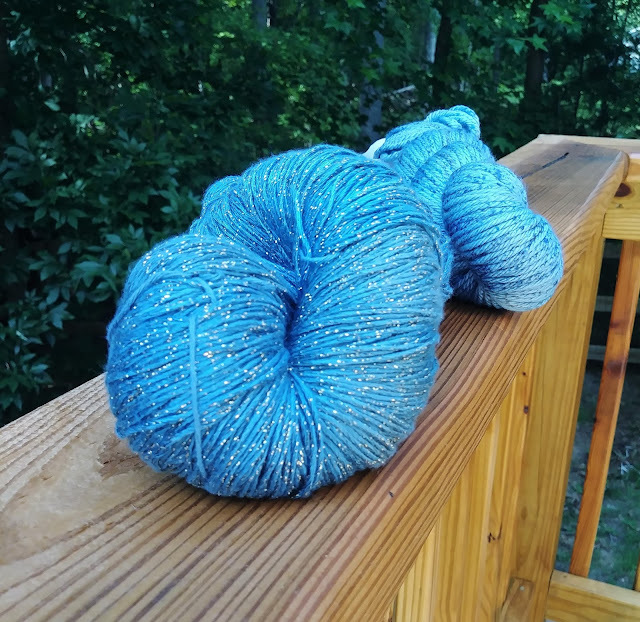 I'm not normally into shiny sparkles but this yarn just called to me. It literally jumped off the shelf and threw itself into my arms. Well, that's not true. The aqua green skein threw itself off the shelf and into my arms.... but I decided the blue would go with my fall/winter clothes much more so than the aqua. 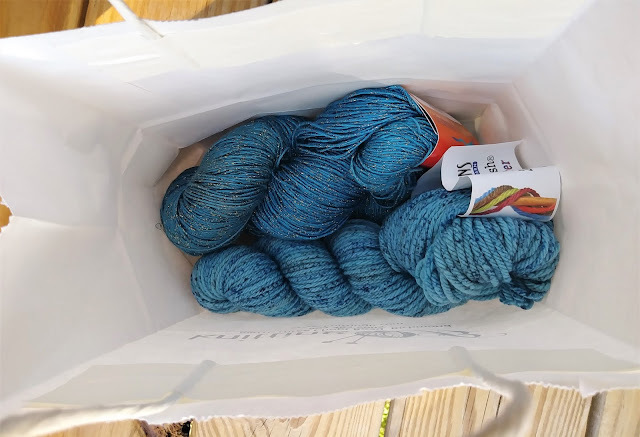 I'm so excited about knitting with the Blue Heron Metalic yarn, I'm thinking seriously of binding off my So Faded sweater sleeve right where I'm at so that I can start knitting with it. I mean, it wouldn't look weird at all if one sleeve was a normal, long sleeve length and the other was above the elbow. No, it wouldn't look strange at all. Knitters would understand. Right? Dammit! I guess I'll finish knitting the sleeve. But I won't be happy about it. Yarn has a way of doing that (jumping off the shelf). Nice choices!! Bummer about the needles. You picked well! Such pretty colors. Don't beat yourself up, it's all good in the scheme of things! nothing wrong with some retail therapy :) I love to go yarn shopping!